First it was Gigabyte and now we have ASRock who have a X99 motherboard previewed on their Facebook page almost every passing day. 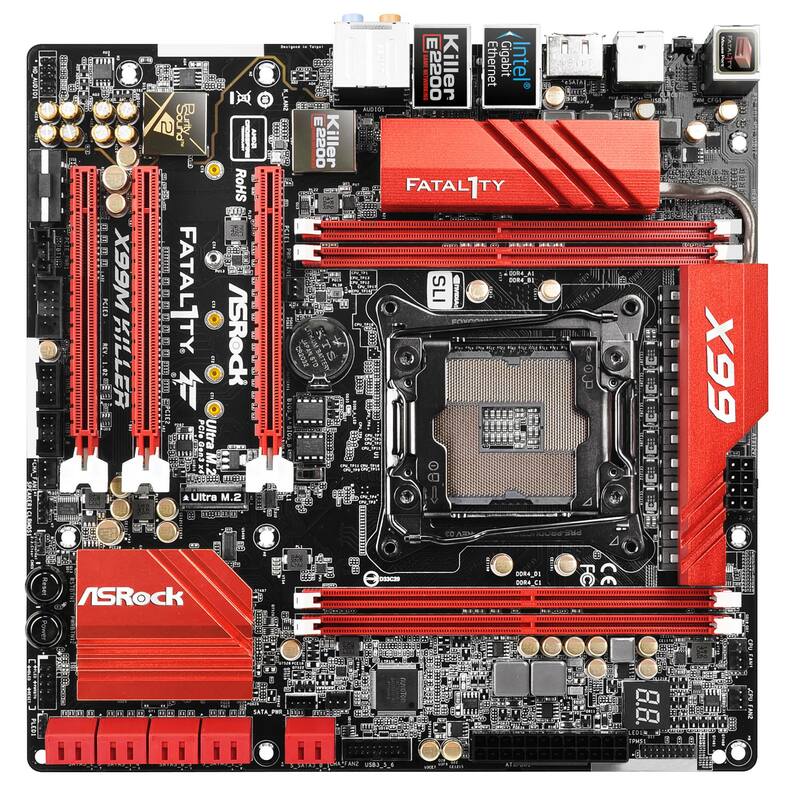 Yesterday, ASRock showed off their X99 WS motherboard for workstation PCs and the motherboard ASRock is showcasing today is their X99M Killer FATAL1TY which features a Micro-ATX form factor which has become a modders favorite since it allows for some creative custom case mods and more rooms to expand elsewhere in your PC chassis. 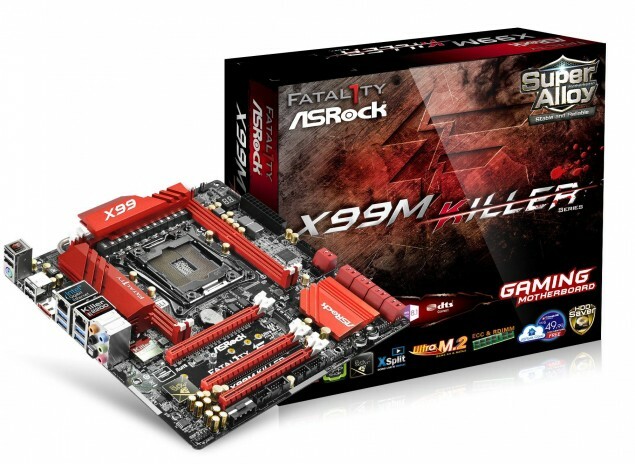 To start off, the ASRock X99M Killer features the LGA 2011-3 socket supporting Intel’s upcoming line of Haswell-E high-end desktop processors which will be available to consumers along with the X99 chipset based motherboards on 29th August 2014. The X99 Killer series from ASRock is more of a gaming oriented lineup with features such as Killer LAN and LAG Free USB / PS2 ports. The LGA 2011-3 socket is powered by a single 8-Pin EPS connector while the 24-Pin board connector provides power to the rest of the electrical components. Since this is built by ASRock, we expect to see some high quality components including the Super Alloy Power design which includes 50G Aluminum Alloy heatsinks, Premium Alloy Chokes, Dual-Stack MOSFETs, Japanese made high-quality conductive polymer capacitors to make is run and perform better. The board features a 12 Phase PWM supply which is impressive for a M-ATX form factor motherboard. The LGA 2011-3 socket is surrounded by four DDR4 DIMM slots (two at each side) which are able to support DDR4 sticks with overclocked specs and capacity of 64 GB in total. 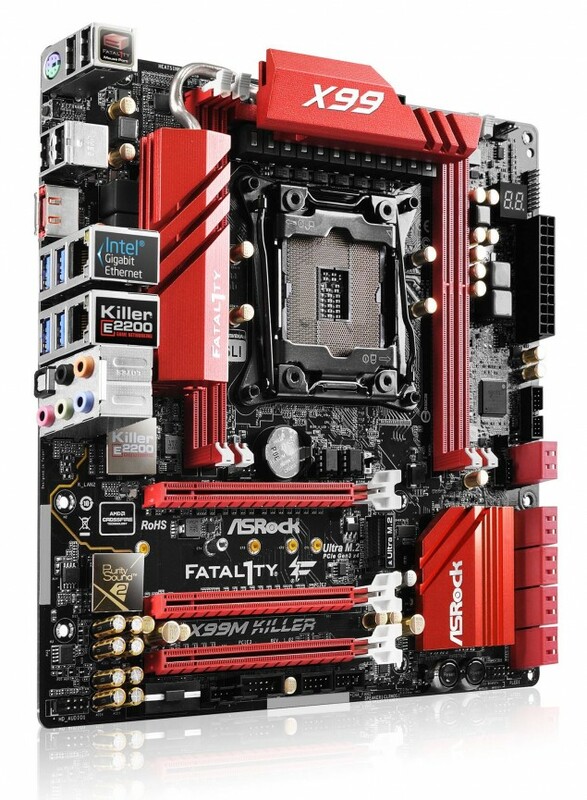 Since this is a Killer series motherboard, we also look at a red and black color scheme which looks quite nice. A Diagnostic LED can be spotted to the right side of the DIMM slots while the Power On/Off and Reset switches have been moved to the bottom side of the board below the PCH heatsink. The X99M KIller FATAL1TY comes with three sets of heatsink, the top PWM heatsinks are interconnected via a heatpipe while the X99 PCH heatsink rests alone. Storage includes a total of ten SATA 6 GBps ports, a USB 3.0 header and two USB 2.0 headers. Expansion slots include three PCI-e 3.0 x 16 slots, the top one of the slots is really closer to the DDR4 DIMM slots so you might want to make sure that the PCB or materials of either one touches the other to cause malfunctions. a Dual USB design can be spotted right next to the CMOS battery and a little switch which enabled either one of the BIOS is spotted right next to it. The Expansion slots are provided additional power through a 4-Pin PEG connector at the bottom of the board. Features such as Killer E2200 LAN and Purity Sound 2 are featured with the audio being on its own isolated PCB. I/O panel includes 4 USB 2.0, 4 USB 3.0, 1 x eSATA, PS/2 port, a Gigabit Ethernet and a Killer E2200 powered LAN port along with a 7.1 channel audio jack. The board should cost between $250 US to $300 US but we can’t say for sure. Expect more details close to launch.